This is the seventh article in a series on ministering to the homeless. This one is special. It is about a ministry by Steve Brigham that has touched my heart to the extent that I’ve included his ministry twice. The first article on his minstry dates back to February of 2007. I thought it was time for an update because the compassion and love and sacrifice required for this ministry is just enormous. The article below is reproduced only in snippets to give you a flavor of what the good Reverand does for the homeless. Please read the Tri-Town News story for the rest of it. On a regular basis the Rev. Steve Brigham of the Lakewood Outreach Ministry wakes at the crack of dawn to visit 11 campsites in Ocean County. These are not the type of campsites where families go to spend a weekend enjoying nature. Brigham walks along railroad tracks and trudges through the muddy forest floor bearing gifts for the homeless people who live in these campsites and who have become his friends. One of his goals is to make sure that the people who live in tent encampments throughout the county have enough propane gas to run the heaters that keep them warm through the cold winter nights. As he reaches a group of tents in what is identifiable as a Mexican encampment, Brigham offers blankets to the people living at the site and tells his amigos where tortillas are being cooked and that he will bring them a big tent the next time he comes. A short time later Brigham is driving his bus – a motel on wheels – to a site called Shanty Town. At this campsite some of the dwellings are made with wood that came from a lumber yard. Other people live in tents that have been provided by Brigham and anonymous donors. The last site of the day was also in Toms River. At that spot Brigham pitched tents for Gloria, 65, and Richard A. Mazzella Jr., 33. Both individuals said they ended up here as a result of financial hardships. 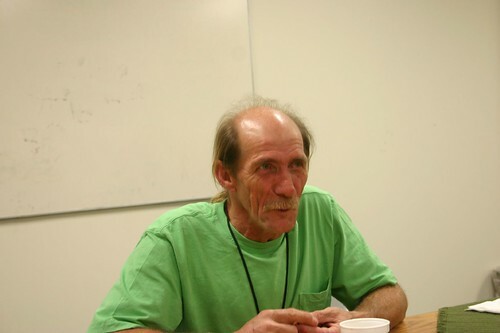 Another resident of the camp, Robert Wayne Pisano, said he has been homeless since he was 16. He is now in his 40s. Pisano said if it were not for Brigham’s kindness, he does not know where he would be. He said Brigham offers people like him a measure of hope. “I have never seen a man take time out of his life like this. This guy cares who you are and where you are. He treats us like we are his own kids. 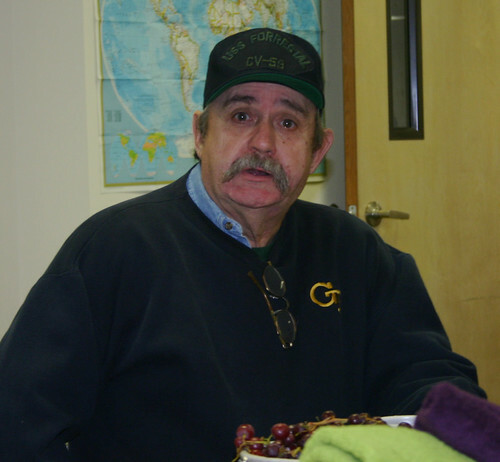 Every piece of clothing I have on right now is because of Steve,” Pisano said. According to statistics from the New Jersey Corporation for Supportive Housing, a national nonprofit, as of Jan. 25, 2007, there were 14,939 homeless people in New Jersey. Of that number, 12,397 were adults and 2,542 were children. In Ocean County, 366 adults were found to be homeless. In Monmouth County, 590 adults were found to homeless, according to information provided by the Corporation for Supportive Housing. These numbers may be under-reported, according to the agency. Anyone who would like to assist the Rev. Steve Brigham may call (732) 364- 0340 or (732) 814-5537. Brigham may also be reached at Lakewood Outreach Ministry Church, P.O. Box 326, Lakewood, NJ 08701. I’ll be regularly inserting stories as winter sets in that illustrate what true ministry to the homeless means. I hope it inspires a few readers to action. Not all these stories are about Christians doing the work. Ministering to the homelessness and needy is not the responsibility of any one religion, any one government, nor any one person. We all must pitch in. Jews, Muslims, Christians, Atheists, everyone with a good heart can share. I am a Christian, but I want to be careful not to offend anyone else in their ministry in their own way. Everyone counts and we all are needed to help. This first report starts in the 1970’s with Reverend Ronal King when he started ministering to homeless. He is the founder of Christians Feed the Hungry . The following story dated February of this year illustrates a very small portion of his work. His ministry works out of Rock Hill, South Carolina, one of the poorest areas of the country. There are areas in which entire communities do not have running water, such as along Blackmon Road. As temperatures hovered below freezing early Thursday, the Rev. Ronal King got in a pickup truck and headed down Interstate 77 in search of those who had nowhere to go to escape the bitter cold and promised snow.“We want to make sure no one freezes to death,” said King, founder of Christians Feed the Hungry, a nonprofit agency that reaches out to the hungry, homeless and those who are destitute and indigent.Before long, King found three men and a woman huddled underneath several I-77 overpasses. Three more were found during the early morning hours behind two Rock Hill businesses, and one other was at a local hospital — all had nowhere to go.King took three to a Charlotte church. He put one up at a Rock Hill hotel. Two got warmth in a Feed the Hungry car for several hours, and one was returned to his family.The eighth person declined assistance. “We gave him scarves, gloves and a hat and food,” King said. “He preferred to make it on his own.”King searches every night for those who are homeless, looking once at 11 p.m. and again at 3 a.m. While King was able to make a difference for the eight on Thursday, he was discouraged because there were no available rooms in a Rock Hill shelter! According to a recent survey, almost 15 percent of South Carolina families do not have the resources to feed themselves during some point of the year.That is why Feed the Hungry’s Rev. Ronal King is out collecting turkeys, to make sure nobody has to go hungry on this Thanksgiving holiday. He purchased nearly 200 turkeys from Wal-Mart in Rock Hill Thursday to take to area churches, shelters, and families in need. King is hoping to get over 1,000 birds by Thanksgiving.“We know just about who we need to feed Thanksgiving Day. But we (also) feed those in prison, EMS workers, people who won’t be home with their families that day. We help! Anyone who will call us will get a meal until the food runs out,” commented Rev. KingThis is what ministering to the homeless and needy means!